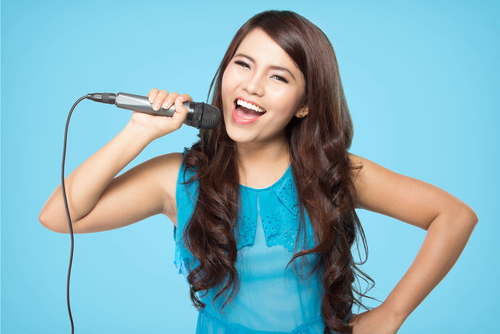 You might be thinking about taking up voice lessons. Maybe you want to learn how to sight-read hymns for your church choir, or maybe you want to take your singer/songwriter skills to the next level. Maybe you want to shine at karaoke night, or you might want to take vocal lessons to help allay your fear of public speaking. No matter what the primary reason might be for taking up voice lessons, most beginning vocal students have similar goals: to become more comfortable with their own voice and gain more confidence when they sing. A vocal teacher can help provide students with a balanced understanding of what they are trying to accomplish and the tools to help them achieve their goals. Vocalists are unlike any other musicians – a pianist is connected to the ivory keys through their fingers, the violinist draws the bow over cradled strings, but a vocalist IS their own instrument. If there is a technique that needs to be corrected at the piano, you simply change your approach to the piano; if there is a technique that needs to be corrected as a vocalist, you have to learn new ways of managing your self. There is no “in-between” – everything happens internally. There is a certain disconnect with instrumentalists and their instruments, and one of their main jobs is to bridge that gap between the two, but a vocalist’s job is, in part, to be able to disconnect their voice from their self. You are not struggling against yourself; you are honing your instrument, and that is an important distinction to make. One of the implications of this realization is that, when you are struggling to breathe properly through a phrase, or produce a beautiful high note, etc., remember to HAVE PATIENCE WITH YOURSELF. The voice is unlike any other instrument, particularly in that it is always in flux. A piano, a violin, and a flute are all subject to fluctuations in temperature, yes, but they are not living organisms. A piano doesn’t have sinus issues from time to time, and a violin can’t catch a cold. Sometimes the vocal apparatus just takes a day off. And that’s OK.
One final thing to remember is this: you are you and no one else. A voice teacher’s job is not to make you sound like them, but to help you realize the potential of your own unique voice. Don’t be discouraged because you don’t sound like your favorite artist; be encouraged, because your voice is your own, and it has its own qualities to share. For information about voice lessons at the Altadena Academy of Music, please call (626) 296-0799 or use our email contact form. This entry was posted in Voice Lessons and tagged Altadena, Singing Lessons Pasadena by altamusicschool. Bookmark the permalink.